It's been a sad few days for book lovers. First, the news of Borders' bankruptcy, then the death of visionary children's book editor and publisher, Margaret McElderry. Discouraged from pursuing a career in children's publishing, McElderry came to the field from her background as a librarian. She ended up being regarded as the grande dame of children's publishing. Hers was the first children's imprint named for an editor. 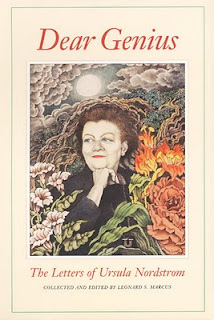 To help dispel the gloomy news, I sought solace by reading about Ursula Nordstrom, another brilliant 20th Century editor who helped elevate children's books from sentimental to inspired, from predictable to unexpected -- and even edgy. I've just begun to delve into Dear Genius, The Letters of Ursula Nordstrom, collected and edited by Leonard Marcus, with a cover illustration by Maurice Sendak (Harper Collins). Nordstrom was the force behind many of the great classics of children's literature, including: Where the Wild Things Are, The Runaway Bunny, Goodnight Moon, Little Bear, The Giving Tree, Harold and The Purple Crayon, and Stuart Little. So far, I'm immersed in the introduction, which focuses on Nordstrom's biography. I've yet to indulge in her actual correspondence - letters which span the years from 1937 to 1982. Based on a cursory glance, it's clear they don't resemble the fleeting correspondence of contemporary email. I look forward to learning a great deal about children's publishing -- not to mention the lost art of letter writing. A total of 200 Borders stores will be closing as part of the chain's reorganization -- including 21 stores in Southern California. Is it naive to hope that this could open up opportunities for independent booksellers to step in? If you live in the City of Los Angeles, honor the spirit of McElderry. Vote YES on measure L -- help increase funding for local libraries. Any other optimistic suggestions to dispel the prevailing gloom? Whenever I'm gloomy, I...I...sniffle, sniffle... WWAAAHHHH!!!!! I heard that Borders is closing here too. I love that store. Something is terribly wrong. sob! On a happy note. I LOVE your blog and am happy I found it. I'm following. I'm sincerely sorry not to add some cheer but I want to report that my long time art director Sara Reynolds (20+ years) at E P Dutton was fired 2 weeks ago and that EP Dutton was dissolved, but for one editor doing only YA Fiction. Things are bad and there is no point in turning our heads away. Despite the sad moniker, I concede there is a time-honored tradition to your approach. I must send you a shipment of tissues. I know, Lee Rae. I think we need tissues all around. Thanks so much for following my blog, Elizabeth! I'm delighted! Yes, it is disturbing about Borders but I'm actually surprised about so many fantasy publishers going out of business. You'd think there would be a huge market for escape literature given the dreary outlook. Thanks for the update, Ashley. That is very grim news indeed about Sara Reynolds and EP Dutton. Good luck to Sara, you and everyone affected by it. I don't know how to dispel the gloom, Megan, but immersing yourself in Nordstrom's letters sounds like the perfect distraction! I just love DEAR GENIUS - it has a permanent place on a corner of my desk, so that I can open it and read any random few pages whenever I need some inspiration. Thanks, Deborah. I'm loving DEAR GENIUS too. Now I'm into her letters - so witty and clever. It's a fascinating historical record as well. What a great idea to keep it on your desk. Pen & Ink is here! Please tell me you spelled “no” incorrectly on purpose for the sake of humor. Whew! There for a few minutes I thought we were in big trouble. I've been wanting to read "Dear Genius" for so long. I need to put it on my library list -- and YES: Yes on L. I'll be tweeting and FBing this (and already have...) Thx for the reminder. Thanks for commenting, Kathy. I'd been meaning to read Dear Genius since I heard Leonard Marcus speak at an SCBWI conference a couple of years ago. I'm enjoying it immensely. Bah! Humbug! More gloom. Less swoon. Please be patient, Senor Scrooge.